After disposing of Sean Soriano in his UFC debut, 'The Crusher' immediately called for a title shot against featherweight champion Jose Aldo. There were more than a few eyeballs watching Tatsuya Kawajiri’s performance on Saturday from Singapore as he finally made his long-awaited UFC debut. A veteran of more than 40 fights with a top-ten ranking for most of his career, Kawajiri didn’t come to the UFC with many of the Pride fighters that transferred over several years ago when the former powerhouse promotion folded. Instead he opted to stay closer to home and continue making his name in and around the Asian fight scene. But after a move to 145 pounds and time ticking away at the chance to fight top competition, Kawajiri signed with the UFC and did not disappoint in his first fight as he submitted fellow newcomer Sean Soriano in the 2nd round. 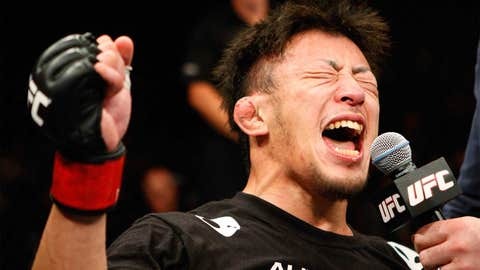 With the first win out of the way and the notorious Octagon jitters behind him, Kawajiri is very excited about a future with the UFC and that includes coming to America as well as fighting on pay-per-view. "I’m looking at this fight as just the beginning," Kawajiri said at the post-fight press conference. "I’m looking to go into the main land of America, and fighting in bigger pay-per-view shows." I’d love to fight the champion Jose Aldo immediately. At 35 years of age, Kawajiri surely has more years behind him than in front in terms of his fighting future so it’s no surprise he’s not interested in warm-up bouts or a slow introduction to the featherweight division. Kawajiri is gunning for the crown and throne, so in a perfect world when he receives his next bout agreement, the other name on the contract would read Jose Aldo. Of course, Kawajiri is realistic enough to understand that’s not going to happen after one win so he’s challenging any fighter in the top ten to give him a fight. "If it’s possible I’d love to fight the champion Jose Aldo immediately, but I’m sure there’s orders I have to follow. So I want to fight some top-ten fighters," Kawajiri said. Kawajiri’s injection into the 145-pound division is a welcome sight and he’s got the experience and style to give anyone problems in the weight class. Now it’s just a matter of setting up the fights and seeing if Kawajiri is ready to carry his legend even further as a member of the UFC.